This entry was posted on Sunday, January 27th, 2008 at 12:04 am	and is filed under Uncategorized. You can follow any responses to this entry through the RSS 2.0 feed. You can leave a response, or trackback from your own site. You are doing great and are an inspiration to people like me. I think about you every single time I go to any store - or any time I think about going to the store. I’ve been good - really good, actually. But only because we just had another $2k in car repairs. But, at least I had the cash to pay for it - even if it did come from my savings that I was going to use for new windows… Alas, it sure does beat a car payment. I appreciate what you are doing - even if it is hard for both you and me. I haven’t been to Target yet this year… that’s a miracle! I love the new site. This is so motivating. I’ll happily wish you luck - I hope you can keep it up! have you tried freecycle? 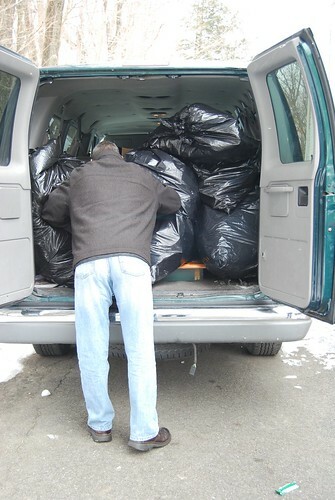 no trips to goodwill…people come to you and pick it up off your porch or driveway! I’m downsizing from a 4100 sq ft house to a 2800 sq ft house after my four oldest have gone off to college and have only three left at home…boy did we accumulate a lot after 9 years in this house! moving is absolutely THE BEST WAY to declutter and simplify! Sigh. You just brought up a problem that I’m having. Well, every post that you write about de-cluttering is related to a problem I’m having but the one I’m sighing over is the home school stuff. Michelle came home for school in the last semester of 8th grade and by 11th grade she had moved to going to college pretty much full time. That did not stop me from accumulating cool stuff that I was sure we would make time for. I have so much stuff that we never used. Or we just barely got into. And I don’t want to give it away. Giving it away would mean we’re done with home school and that she’s really really grown up. She’ll be 18 in 13 days. She has almost two years of college under her belt already. I need to let go. I’ve been making weekly trips to Goodwill too. I’ve also been Freecycling a bunch of stuff that Goodwill can’t take and would be better used than recycled like Diaper Genie refills that we no longer have or need (yeah!) and plastic children’s hangers from Old Navy and Carter’s. I sold the last of the baby things - Pack N Play - on Craigslist yesterday. My husband Freecycled our old satellite dish and receivers that we haven’t used since 2002. I can see a difference but I’m sure nobody else can. It’s amazing how well I can hide all of our clutter and unused crap. Keep going! You will get there. I am also spending January decluttering. Been to Goodwill twice, got rid of old VCRs and computer keyboards, and a huge monitor plus several bags of clothes. My son’s preschool recycles paper as a fundraiser, I take a big box of papers every time I go. I’ve sorted through school papers and artwork for my bigger kids, unloaded papers from classes I’ve taught years ago, and I’m slowly recycling 14 years of academic journals (no one will take them, I’ve checked, their only value is their weight as paper — $90 a ton.) I even sold a big box of books to a secondhand bookstore. Is my house decluttered yet? Umm . . . no. The results are subtle, even to my husband, who thinks I spend all day on the internet, now where did he get that idea. Next, I am having a shedder come to the house and shred all those old bank statements, check carbons, and old bills. Not sure exactly when the difference will be visible to strangers (”what a spacious, airy home you have”) but everyday I get a little lighter. You will too. Keep on, keeping on! Oh, man…. Not the cassettes!!! Is he thinking they will make a comeback one day, or that they will be worth lots and lots of money? You know…that muffled sound is hard to duplicate. Maybe that’s what he likes about them. I too just got rid of all my cassettes. With Itunes and Ipods, who needs them??? My husband however…. refuses, so I feel your pain! Please let me know if you ever get your husband to part with the tapes and how you convinced him to do so. I love to get rid of things (I think only because it alows for room to buy more stuff, bad I know) but my husband walks a fine line between collecting and hording. He can not part with anything and it just about drives me crazy! He is allowed one small room in our home to do with as he wishes and it still has boxes that he moved from our old house that still were not unpacked from when he moved out of the dorm in college. Keep a record of your donations to Goodwill. If you do, you can claim it on your tax return as “charitable donations.” You’d be amazed at the value they assign some of that stuff (and what the accumulated total will be!) It’ll boost your refund or at least lessen what you owe! So when do we get to see apicture of the dreaded attic? It must be a huge space to have given away all that stuff and still not see a dent. I am still trying to convince my husband he doesn’t need his old cassette tapes and VHS tapes and old books and old computer stuff… like his first Commodore 64… he still has all the pieces and they are stored in the original boxes…. some 23 years after he got them…. and there is no good reason to keep any of it… unless driving me nuts is a good reason. Opps… I think that was a rant. Ah, the tapes. What is up with that? We finally got rid of our big bucket of tapes but it took 2-3 years. You’ll start to see the difference soon! We actually hired an organizer for a few hours and it was totally worth it. She got me to see all of my *issues* with stuff. It’s changed the way I see all of our processes in the house, including shopping. I have a cassette player in my minivan. We drove to Florida last winter and I went to FYI to pick up some tapes for the ride. The teeny-bopper working there just stared at me when I asked where the cassette tapes were. (Then I’m pretty sure she called me ma’am). I think this not spending money thing is a great idea. I want to try it with my husband and kids. I am wondering if you have a strategy for turning down invites that involve spending lots of money? I don’t know how you do it with seven kids! I have three and it costs me a fortune to do anything. What do you tell people that ask you and your crew to get together? Sorry… can’t… we’re on a fiscal fast? Sometimes I’d like to say just that, but I feel like I’d just come off sounding cheap. Thanks!! Chris says: Well, we aren’t doing a fiscal fast. I am just not buying anything we don’t need. Having said that, I have no trouble turning down invites that require me to spend money I don’t want to spend. Luckily I guess most of my friends are just as cheap. My parents are holding onto cassette tapes too. The thing is, they even admit that they don’t even know what is on them. Even if you don’t see a difference, there definitely is. I’m relieved that there’s someone else out there who can get rid of a lot of stuff and not notice the difference. I have a lot of things to go to Goodwill and I just need to get it in the van and go! My dh has a box of cassette tapes he is especially attached to also…do think he’ll notice that he hasn’t seen them since I threw them out two years ago? bwahahaha. My husband nags me about my cassettes and (gasp!) LPs, but at least I can still play them. I tell him I’d be glad to get rid of them . . . as long as he first gets me all those same albums on CD. That shuts him up. My goodwill bags are packed and still sitting outside my closet waiting to grow legs and walk themselves to the van! I clean out the closet after Christmas and then after Summer break only to have it sit until Spring and Fall! ha! Regarding the coloring books. Can you take the covers off and separate the pages? Then the kids will have a stack or a file of just the uncolored pages to choose from when they want to color? I know — not the same thing as a fresh, new, UNCOLORED coloring book, but may save your sanity a smidgen. I got rid of all of my cassette tapes at a yardsale last year. However, being the obsessive/compulsive person I am - I photocopied my favorite mix inserts (all songs were duly noted on the cassette insert). I managed to recreate my all time favorite 80’s college mix from Itunes, etc. Ah, the memories! I still have the wooden crates that I had purchased from Target that held the darn things. I need to take those to Goodwill. Baby steps, baby steps. I tried to throw out all our cassette tapes a few weeks ago while packing, for the same reason, until my husband pointed out we do have 1 cassette player in teh house, the fact that we never used it was not fazing him, so instead it is now packed to move on to the next house later this month. We have moved these to 4 different houses since we last used them. Burn all to CD’s and get rid of the tapes! It’s win-win. Oh and for the record, all you need to do is patch the sound in, record with Audacity (free program) and it costs you nothing more than blank cd’s and a cord to run sound out and back in. Easy peasy. Chris says: Uh, what? How do you do that? My husband and I just had that conversation about VHS tapes. Our VCR has been broken for a year! This week I boxed up all the tapes to go out the door, and his suggestion was that maybe we could just get a new VCR. We’re already noticing a big difference around here in the clutter, but I think it’s because it was so monstrous to begin with. Are you SURE you’re not married to my husband? Cause we have a box of cassettes. And college textbooks. LOTS of textbooks. How does your husband feel having his backside all over the Internet? Oh, good job on the Goodwill. I have learned from experience that men do not like to part with ANYTHING from their “youth”, cassette tapes included. Ask me. My partner still has a pair of MC Hammer style sweatpants circa 1991. Even though I implemented the 10 year rule a long time ago (over 10 years, garbage!) these pants keep finding their way back to the shelf. Oh, and about freecycle and craig’s list. Release the guilt of not using them. I was a member of a very active freecycle list. When we moved I joined up in our new town. The list here stinks! Nobody participates unless it is to ask for stuff. Anyway, I think the spirit of your quest is great. I had to toss stuff that could have been given away or recycled, but *I* found it was more important to just get the stuff out of the house, start a clean slate and *then* worry about being politically correct. Putting it aside to give away to someone who might want it defeats the purpose of the quest! You’re doing great and inspiring many. Thank you. Are you, by any chance, related to my husband? You know, the man who moves the sack of rubbish, which I’d placed **in front** of the door, so it couldn’t be forgotten when he leaves for work, out of his way, so that he can get out the door. WITHOUT THE FREAKIN’ SACK. We’re in the process of digitizing our most precious video tapes so that we can toss the tapes. More than any other reason, I love how little space disks need as opposed to video tapes! Email me Chris and I’ll send you instructions. BETA tapes. Yep that’s right BETA tapes and it’s been years since I’ve had a working beta player. So — chin up - eventually those cassette tapes will go away. Just like (eventually) my beta tapes went away.